**All Currahees traveling to Fort Campbell - Please Note! Fort Campbell is no longer accepting state issued identification from Minnesota, Illinois, Missouri, New Mexico, and the state of Washington. If you have a state issued ID from these states you will need additional identification to enter the gates at Fort Campbell. A federal ID, such as a passport, Native American tribal documents, and any Defense Department card will be accepted. Please make arrangements to carry these documents during your travel. For more information about the documents please see the information posted in The Leaf-Chronicle or call the Public Affairs Office at 270-798-3025. When arriving to post for the first time, you will need to acquire a vehicle pass. Acquiring the pass will require you to report to Gate 4 off of Route 41A (the route that grants access to gates 1-7). By providing the Vehicle Registration Building with this information you will receive a 10 day pass authorizing you to come and go from post as you please. After receiving your vehicle pass from the registration personnel at Gate 4, you may utilize any gate to access post. 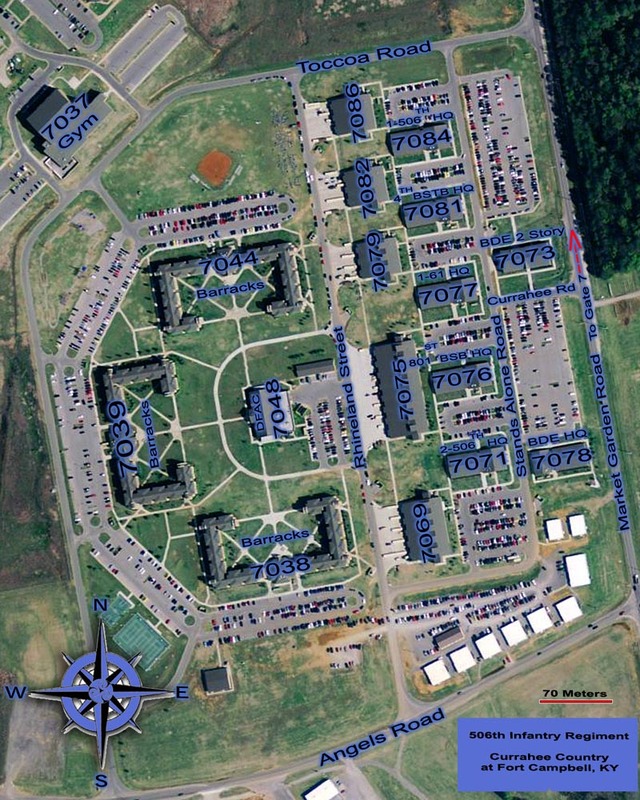 Because the Currahee Footprint is just inside Gate 7, use the second set of directions for Gate 7 access. Take EXIT 86 in Kentucky. Take a RIGHT onto CHAFEE RD. Enter through Gate 4 and continue to the traffic signal. Continue on SCREAMING EAGLE BLVD. until it comes to its intersection with MARKET GARDEN RD. Take a RIGHT onto MARKET GARDEN RD. Take a LEFT onto TOCCOA RD. Turn LEFT to take the DONELSON PIKE NORTH ramp toward I-40. Merge onto DONELSON PIKE/ TN-255 N.
Merge onto I-40 W via the ramp on the LEFT toward KNOXVILLE. Keep RIGHT to take I-24 W via EXIT 211 toward I-65 N/ LOUISVILLE/ CLARKSVILLE. Keep LEFT to take I-24 W via EXIT 88B toward CLARKSVILLE (Crossing into KENTUCKY). Take the US-41-ALT exit, EXIT 86, toward PENNYRILE PARKWAY/ FT CAMPBELL/ HOPKINSVILLE. Take the ramp toward FT. CAMPBELL. Turn LEFT onto US-41 ALT S.
Morgan Rd. turns into Glider Rd. upon entering post. Take a LEFT onto MARKET GARDEN RD. Cross the train tracks and take the first RIGHT on TOCCOA RD. Take the first LEFT onto STANDS ALONE AVE. Welcome to the CURRAHEE FOOTPRINT.